This pouring vessel was made from slabs of clay cut using a conic templates. 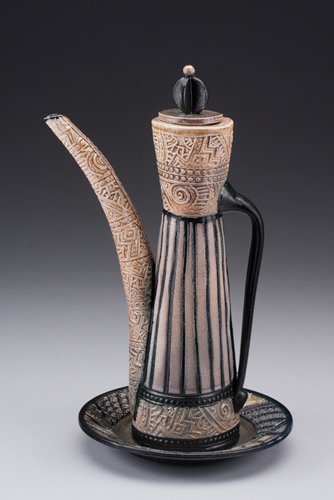 The spout was formed on a mandrel and applied to the teapot. The handle was pulled from the teapot the day after it was formed. The plate was thrown on the wheel. Each piece was decorated with stamps and carving. After bisque firing, the ewer and plate were painted with slips and fired in a salt kiln to cone 10. 18″ tall, $175, sold.